The metallic charcoal Cubico is a stylish self-watering tall square planter that is suitable for both indoor and outdoor use. 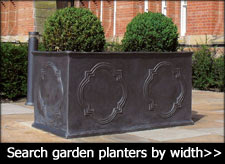 It is an exceptionally high quality planter that is lightweight, durable, UV and frost resistant and available in three different sizes. 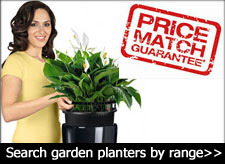 The complete sub-irrigation system is included in the price. 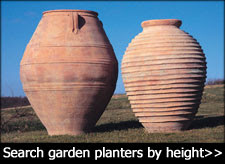 Simply fill the reservoir with water and your plants will be taken care of for up to 12 weeks. Cubico planters are excellent for framing entrances and dividing spaces. 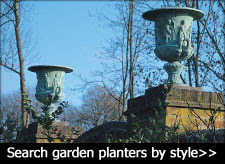 Use at home or in the office to display your favourite indoor plants or plant up outside with annuals, perennials or topiary to achieve a look capable of enhancing even the grandest of designs. Charcoal is a neutral colour and there are few specimens that will clash with the colour of this planter, we have found that bright flowering annuals work well and of course, lush green buxus sempervirens. Thank you for coming along yesterday and fitting the fantastic pots. People generally love them, so all good. Thanks also for the links - we are purchasing the plant feed today. I have copied Serene, who you met, into this email, as Friday is my last day here, so she will be your point of contact from now on. We will pass on the invoice and make sure it gets paid.